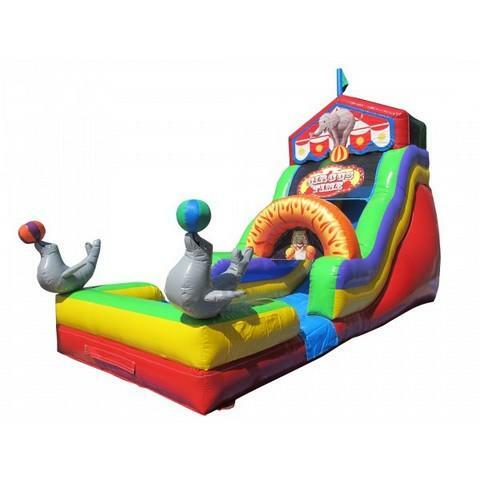 The Circus Time Inflatable Water Slide features four circus animals and fun bright colors. Two large gray seals with colorful beach balls balanced on their noses welcome your guests to the ‘greatest slide on Earth!’ As they climb up to the colorful ‘big top’ they’ll see an elephant balancing on a ball under a tent and flag. And when they slide they’ll ‘jump’ through a ‘flaming’ ring along with a friendly leaping circus tiger!